Still using a building built in 1960 albeit carrying a lot of refurbishments, Newport Pagnell achieves a lot with the little space available. First two hours free for all vehicles, after which cars must pay £15 for a further 24 hours and HGVs, caravans and coaches must pay £29 (or £31 to include a £10 meal voucher). 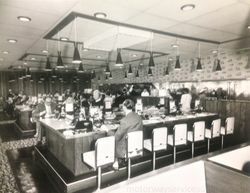 The Grill & Griddle restaurant in 1960. 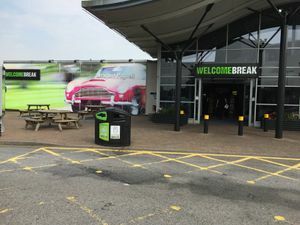 The UK's oldest service area was once a sight to behold. Full details are provided on the history page. The first motorway WHSmith was trialled here before being rolled out to almost every service station in the country. In April 2013, Burger King returned to the services, having previously been removed to save space. In The Smiths' song 'Is It Really So Strange? ', one of the lines is "I lost my bag at Newport Pagnell", referring to the services. Tesla Superchargers are due to be installed on the northbound side soon.